Great tools! I have a coach interview this week. Any pointers that will help me land the job? I have ten years of classroom teaching experience, four years of college coaching experience, and a specialist degree in Educational Leadership. an effective coach is the ability to build relational trust with staff. Good luck! I got the job! I am super excited, but know that I will need to hit the ground running. Your website has been my best friend (I started this week. So quick!) Thank you for sharing with us!!! Thanks for sharing these awesome tools! You’re welcome and thanks for the comment! I am interested in visiting your site often. I am new to coaching and I want to make it a successful year for the teachers, students and myself. This is awesome! I know I’m going to be busy reading all your posts. I love this one and will definitely bookmark it-your visuals and handouts are awesome (I’m a sucker for cool fonts too). Loving the instructional observation toolkit! I agree with you that relationships are HUGE for successful coaching; if a teacher has no relationship with you, or worse, a poor relationship with you, they won’t be willing to work with you or accept your feedback. Ms. Houser, I just stumbled on this very helpful website. I’m in a M.Ed. program in a coaching/mentoring class right now. Our final assignment is putting together a coaching plan. I’m overwhelmed, but it looks like you’ve got some helpful ideas here. Do you have an helpful advice that I might use in putting together the plan? 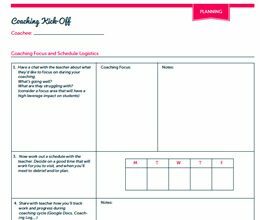 You might find my post on “Creating a Coaching Work Plan” helpful. I put together an infographic based on a chapter in The Art of Coaching. You might also want to check out this book. I have been a coach for about 7 years and my job gets tweaked every year! I am looking forward to exploring the tools that you have shared. I have some that we already use, but they are not as professional. Thank you for sharing! Wow!…7 years, that’s impressive! Thanks for taking the time to comment…I’m glad the tools have been useful. If there are any other tools you think would be supportive to your work that I can “professionalize” a bit, please let me know! I love your blog, your tips and tools are very helpful. 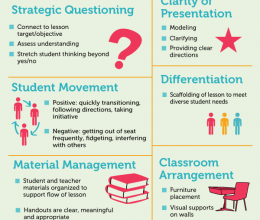 I am a first year coach with a lot of PD and classroom experience. Since my principal hired me as an “extra” this year we have been kind-of winging my schedule and role. As we look forward to next school year we’d like to tighten up my schedule and responsibilities. Can you give me an idea of how you are accountable to your principal without sacrifying trust with the teachers. Do you meet with your principal weekly? Do you “hand in” a form? Are teachers required to work with you? Such a good question!! So good in fact that I think it’s worthy of a blog post :)…stayed tuned for a post in response to your question next Monday. Thank you so much! I love notesplus. I want to sync the files with google docs. I can see a couple places that will sync to Dropbox. Is there an easy way to move them directly to google docs? I recently began a position working as an ESL Literacy coach and in my research I discovered your website. I am looking forward to incorporating your tools into my coaching sessions! Thanks so much for sharing! Hi Kimberly! Thanks so much for your comment. Hope your year is going well! Thank you for all of your resources. This is helping me to create a structure for my coaching next year. I wanted to know how many teachers you work with in a 6 week cycle, and how many you work with in total…just to get a feel for what a successful coach’s load is. 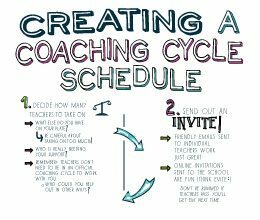 I typically work with 5-7 teachers within a 6 week coaching cycle. I try to work with every teacher at least once during the year. I have an interview for a coaching position in two days. I’ve taught for the last 9 years…and am really stressing out about this interview. I have NO IDEA what to expect. The task I’ve been emailed is even freaking me out! I guess I’ve got a block, because I’ve never actually been a coach. Thank you for your helpful information!! Here’s the task I’m working on…if anyone is curious! Your supervisor has arranged with campus administration for you to coach three teachers. You are to contact the principal to set up the initial meeting. •	What should be included in the first email? •	How would you structure the first face to face meeting? •	What materials should you take to conduct a successful meeting. Explain why you are choosing to take these materials. •	What are your goals and talking points for the meeting? Ooops, Amber, I just realized I referred you to the same post you commented from :) Did you see anything referenced in the Initial Coaching Meeting agenda you think would be helpful? Last year you mentioned taking a course through Coursera. I’m wondering if it was Coaching Teachers: Promoting Changes that Stick. I know you recommended it and I’ve been waiting to take it but wasn’t sure if this was the one. Thanks for all of your wonderful resources and suggestions! Hi Gina! Yes, that’s the one. It’s soooo good, you have to take! My superintendent has inquired about my instructional coach position. I am very interested, but scared to death of leading the entire faculty on professional development days. I am fine with small group but terrified of large groups. 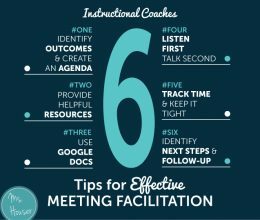 How much time does instructional coach spend a whole group or whole staff professional development ? I bought your kit to help me get started for my new job as an academic literacy coach. Do you happen to have a letter of introduction that I could use with my clients? I’m nervous about making a great first impression. Please let me know if she shares it with you! I would love to see it! Thank you for sharing so many resources! I just got a job as a Learning support Coach! So excited for this new journey. Is your instructional coaching planner editable to personalize questions or format to a particular district need? Hi Julie! Thanks so much for your comment. The form fields within the Coaching Kit are fillable, however all of the designed text is not. If you have a particular request for a customized form, please email me directly to see if we can arrange something! Are you aware of any graduate programs that focus on instructional coaching? I’ve been out of the classroom now for a few years, but still working in the education field as a PD rep for a ed tech company. Would love to explore the field of coaching.